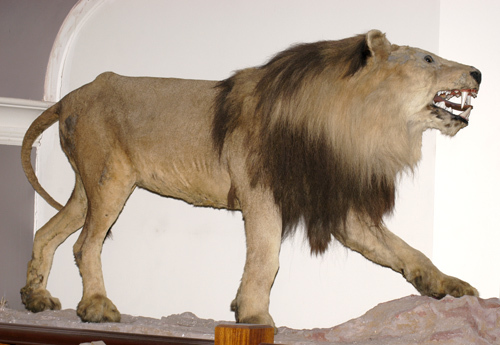 Among the more striking items in the Saffron Walden Museum in Essex is a stuffed lion named Wallace. In a former life, Wallace had been a star in George Wombwell’s nineteenth-century traveling menagerie of exotic beasts and birds. Born in Edinburgh in 1812, Wallace was the first African lion to be bred in England and was perhaps named after William Wallace, the Scottish freedom fighter. While Wallace was never to know freedom, he was a fighter, and his most renowned performance occurred in July 1825 in a factory year in Warwick. Wombwell had arranged for his pet lion Nero, a large but gentle soul, to be baited by six trained fighting dogs for a crowd eager for blood sport. The docile Nero, however, refused to fight the dogs, and Wombwell finally had to admit his lion’s defeat. After removing Nero from the pit, Wombwell immediately offered to match Wallace against six more dogs. The bet was taken and a fight arranged for the next Saturday night. Six dogs named Tinker, Ball, Billy, Sweep, Turpin, Tiger were set on the lion in pairs as had been the case with Nero. This time, however, each dog lasted less than a minute in the cage with Wallace. "Jonathan Wilson, whose arm was severly bitten and torn at our fair, by Wombwell's lion, Wallace ... continued in a favourable state until Saturday, when the arm was suddently attacked by violent inflammation, followed rapidly by mortification [of the arm, not Wilson]. In this state he continued till Wednesday morning, when he died at his own home, having, the day before, requested to be moved thither from the infimary." By early July in 1838, Wallace was in sad decline. A journalist for the local Wolverhampton newspaper noted the difference in the lion from his last visit: "Numerous persons who have visited the Menagerie over the past week have had their feelings unusually excited by the worn out appearance of their old favourite lion, Wallace. This once fine and noble creature seems to be gradually sinking from premature old age and is at times so weak as scarcely to be able to support his own weight." "Lion Barbarus Grey (The Lion Wallace) Presented by Mr. G. Wombwell. This animal is remarkable as the first lion bred in this country and was during his life of 25 years in collection of Mr. G. Wombwell, surviving his battle with the dogs at Warwick, several years."